This lesson will show you how to update a lesson in Mindtouch. It is assumed that you are familiar with creating a new page or inserting a lesson into an existing page. 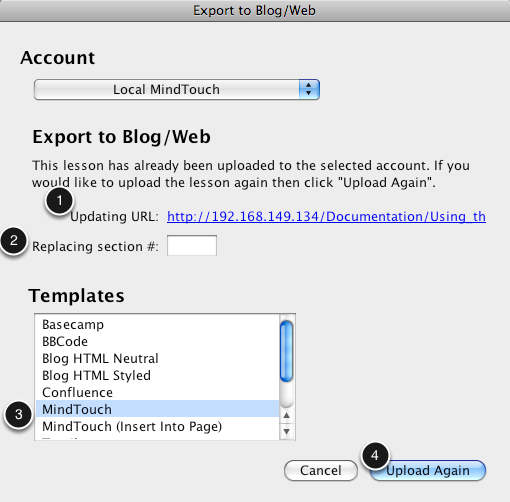 When you export a lesson to Mindtouch and the lesson has been uploaded to Mindtouch previously you will see this dialog. The URL of the page the lesson was uploaded to is provided (1) and you can click on it to view the page in your browser (rollover the link to see a tooltip with the full URL). When updating the page you can specify a section to target if you only want to replace some of the content on the page (2). Leave the section number empty to replace the entire page. If you are not familiar with how to target a section of a page please see this lesson. If you do specify a section number make sure and use the Mindtouch (Insert Into Page) template, otherwise use the Mindtouch template (3). When you have finished configuring the upload settings click the Upload Again button (4) to update the Mindtouch page.